A spacious three bedroom detached bungalow situated in a desirable location just off the Moreton road on the outskirts of Buckingham. The property is for sale with no upper chain and benefits from being within walking distance of the town centre, Upvc double glazing, a refitted 'Worcester' gas fired boiler and front & rear gardens. The garage is a larger than average double garage so has the potential for a garage conversion and also a loft conversion (Subject to necessary Planning Permissions). 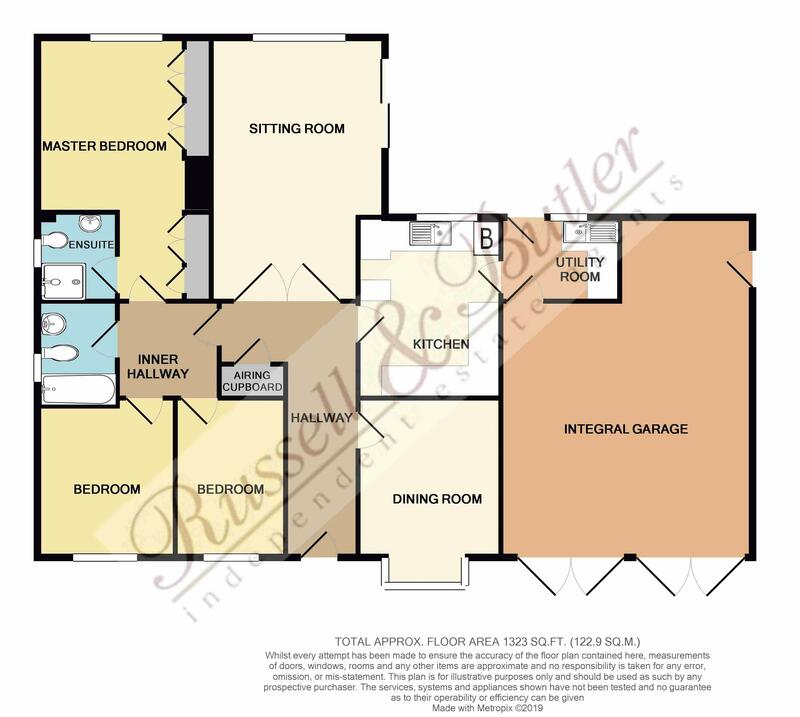 The accommodation fully comprises; Entrance hall, kitchen, utility, sitting room, dining room, bedroom one with ensuite, two further bedrooms and bathroom. To the outside; Front & rear gardens, double width garage and driveway providing off road parking for two cars. No Upper Chain. EPC Rating C.
Radiator, coving to ceiling, access to loft space, airing cupboard housing hot water tank with linen shelving as fitted. Two radiators, coving to ceiling, 'capped' gas fire, Upvc double glazed window to front aspect, sliding door to side aspect. Upvc double glazed box bay window to front aspect, radiator, coving to ceiling. A range of base and eye level units, stainless steel sink unit, cupboard under, work tops over, tiling to splash areas, coving to ceiling, 'Worcester' gas fired boiler serving both domestic hot water and gas to radiator central heating, radiator, Upvc double glazed window to rear aspect. Stainless steel sink unit with cupboard under, work top over, tiling to splash areas, coving to ceiling, radiator, Upvc double glazed window to rear aspect, Upvc double glazed door to rear aspect, access to garage. maximum length. A range of built in wardrobes with rail and shelving above, radiator, coving to ceiling, Upvc double glazed window to rear aspect. Fully tiled walk in shower, low level w/c, pedestal wash hand basin, tiling to splash areas, radiator, coving to ceiling, Upvc double glazed window to side aspect. Upvc double glazed window to front aspect, radiator, coving to ceiling. A range of built in storage, radiator, coving to ceiling, double glazed window to front aspect. Walk in bath, pedestal wash hand basin, tiling to splash areas, low level w/c, radiator, coving to ceiling, Upvc double glazed window to side aspect. Laid mainly to lawn with a range of flower and shrub beds, driveway providing off road parking for two cars, pathway leading to property entrance, gated side access, outside light. Laid mainly to lawn with paved area, outside tap, low level brick walling. length is maximum measurement Two double doors to front aspect, power and light connected, door to side. All mains services connected. Council tax band E.